We are proud to now offer Fascia's Chocolates at Roaring Oaks Florist in Lakeville. 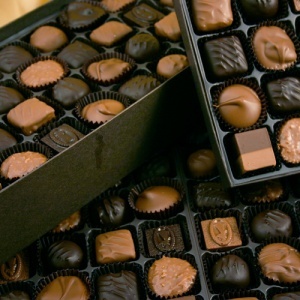 Fascia's Chocolates are high end chocolates, family handcrafted locally in Waterbury, CT. The Fascia family is still handcrafting their products the same way they have since 1964. They are proud of their quality and recipes and continue to receive wonderful reviews from their customers. Fascia's products range from the traditionally high-end, like Gourmet Truffles and Cordial Cherries, to family favorites like molded novelties, fudge, and the simple goodness of chocolate covered items like pretzels, potato chips, grahams, and much more. Fascia’s Chocolates has enjoyed a loyal following in the Waterbury area, even through moving six times in our history. Since the fall of 2013 they have been located in their own 18,000 sf factory where they have also created a tourist destination with tours, birthday parties, and other private group events drawing thousands of new customers each year. Fascia's Chocolates has been very generous and has provided Roaring Oaks on Main St. in Lakeville, CT with a sample platter for our upcoming Open House this Saturday, April 16th! Visit our Roaring Oaks Florist Facebook event page to RSVP or just stop by for delicious chocolates, food, fun and lots of interesting flowers.